I started dating someone back in early 2007. The relationship seemed doomed from the onset, as another man stole my heart that first year. The love, however, was unrequited, and so I stayed with my boyfriend regardless. In the decade that has followed, my faraway love reappeared from time to time. Each visit kept us locked in my room for days, under the covers with the lights off and mobile devices muted. But the time has come to move on. I must wipe away my tears of sorrow as a new dawn appears. My new love has a classic beauty. Her fashion sense is as sharp as her mind. I'm even willing to share her with a boy and a dog. Goodbye, Professor Layton. Hello, Lady Katrielle! It is time for Layton's Mystery Journey: Katrielle and the Millionaires' Conspiracy. When Professor Layton and the Curious Village was released on the Nintendo DS a decade ago, I left my life behind as I fell in love with the mysterious world of Layton. The professor, it turned out, was quite the detective. 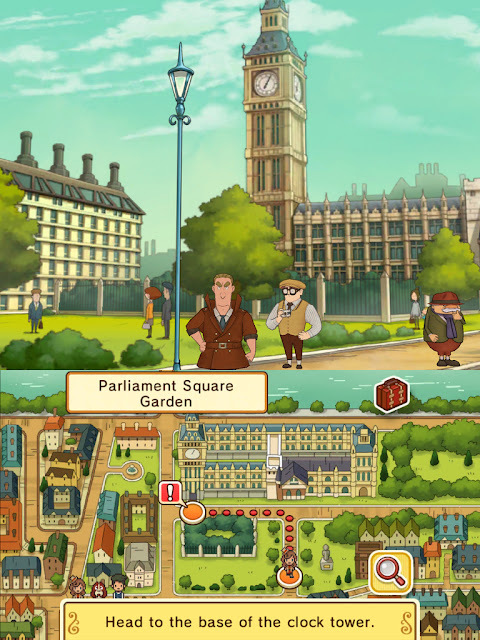 By completing puzzle after puzzle, Professor Layton and his sidekick Luke compile clues to solve mysteries. The puzzles were quirky, the wit was dry, and the love was pure. 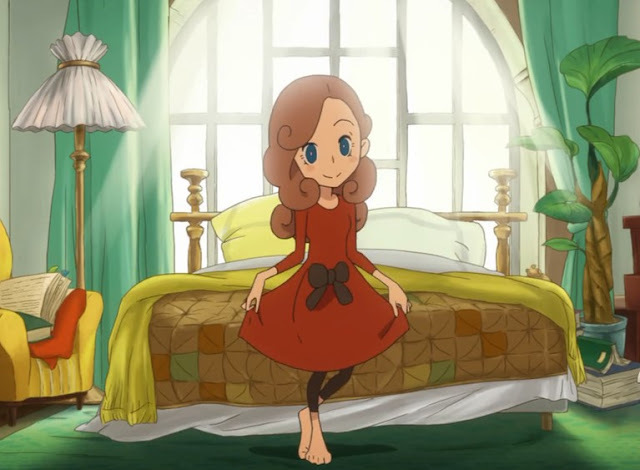 It is now time to pass on the Layton torch to Lady Katrielle, or Kat for short. Kat is the professor's daughter. She is just starting up her very own detective agency with the help of a dog pal named Sherl (after Sherlock Holmes) and an assistant named Earnest. Layton's Mystery Journey is everything that enchanted me about the original title (as well as most of the subsequent ones in the series) – and also everything that made me want to throw my DS against a wall, which is a good thing for once. 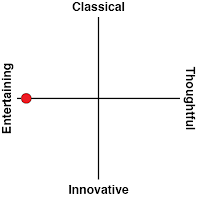 It means I'm enthralled and must continue, instead of not caring if I get stuck and give up. 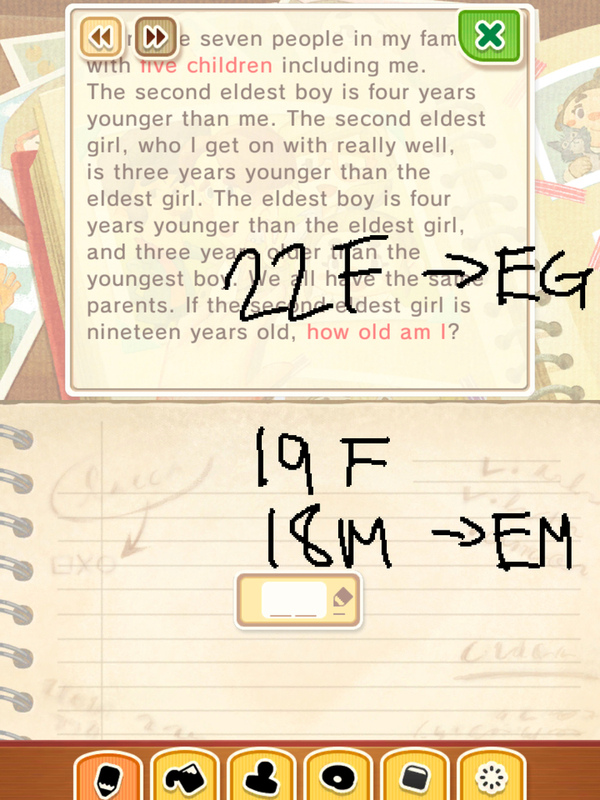 The obtuse puzzles become less infuriating as you remember that's the trick with the Layton series: think outside of the box and you will find your way. For example, the first puzzle requires completing a letter "K" in a box... but the answer means creating the letter with negative space rather than positive. Simple mistakes can really trip you up. Every puzzle in the game (well, in the main story mode) is numbered, making it easy to know if you missed something and need to return. 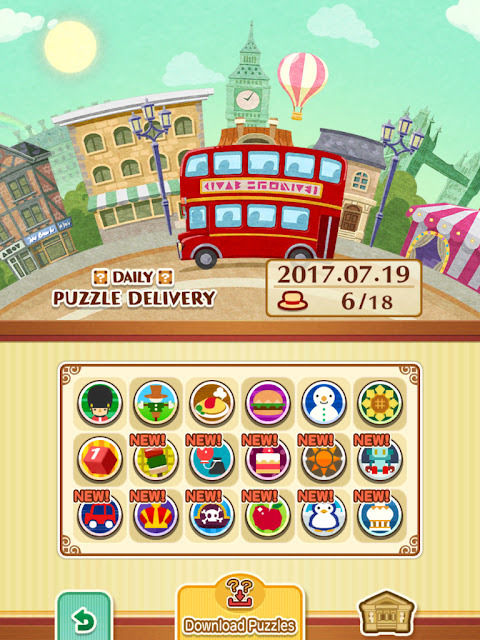 Completed puzzles earn the in-game currency, Picarats. Wrong answers lower the value of puzzles, and a correct answer will earn you whatever remains. The higher the value, the harder the puzzle. If you're stuck, use hint coins – found throughout the game – to get one or multiple hints. Each chapter (or story) breaks down into six parts. At the end of each is the reveal of a clue that will lead to the final solution, represented by a literal piece of the puzzle. While Kat does take on her own cases, she often works with the Metropolitan Police when they are in a bind. Her first case – aside from agreeing to help Sherl learn who he is – is to figure out where one of the hands on Big Ben has gone. Yes, a giant metal clock hand has gone missing, and nobody can find it! The solution is even more outlandish than the problem yet somehow makes complete sense. It's this odd balance that makes the Layton series a favourite of mine, and that allows for Layton's Mystery Journey to follow in the footsteps left by Kat's father. Not all puzzles in the story mode are actually related to the story. Often, one will randomly pop up as you're searching for hint coins (you need all that you can get, trust me). I far prefer it, however, when I'm talking to someone who has nothing to do with the case but they have a puzzle for me anyway. Some of these characters are recurring: Gudrun Weldon is a runner and is exploring the city on foot, and Douglas Dert is a reporter, for example. Of course, there isn't just a story mode. It seems that no game has just one mode anymore. At every turn, you can do something new in Layton's Mystery Journey: Katrielle and the Millionaires' Conspiracy. Take a break from puzzles or cases to decorate the detective agency, or look through random artefacts that have no meaning to the game or the series whatsoever. Or boot up on a daily basis to grab a new puzzle. These puzzles are stand-alone and operate outside of the story while remaining tied to a specific save account (three slots are available). Completing them will earn Museum Points, which unlock bits of information about each of the past Layton games (minus the Phoenix Wright crossover). DLC includes outfits and puzzles, either paired (outfit + puzzle) or bundled together (several pairs combined). And there's more. So much more. But honestly, half the fun is randomly coming across new parts in the game, and I don't want to take that away from anyone! For the first time, Layton's Mystery Journey brings the series to mobile devices in addition to Nintendo's handhelds. In Japan the versions were released simultaneously, but the rest of the world will be waiting several weeks more to get their hands on the 3DS version. The game relies heavily on touch features, but those features still only take up real estate at the bottom half of my iPad's screen. It's the strangest thing though, I've actually gotten used to it. I was prepared to tear the developers a new one for their decisions when it comes to what it touchable, but in actuality only using the bottom portion with a touch interface makes for one-handed play – a big bonus on mobile devices. I can go on infinitely about how much I am enjoying Layton's Mystery Journey: Katrielle and the Millionaires' Conspiracy. The game present little truly new to the series' gameplay, but since it already shone in past titles that's a great thing. 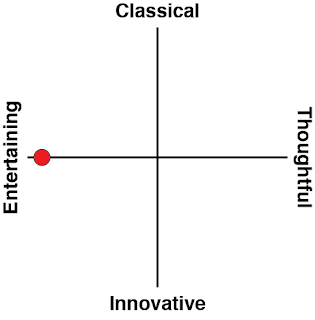 The characters are lovable, often with dry wit and secret pasts (or presents). Whimsy combines with reality, creating a fantastic believable world. The game promises at least dozens of hours of gameplay with limitless expansion potential, and I'm excited to see where it goes.